At her husband's side throughout the American Revolution, Martha was a brave companion in wartime. 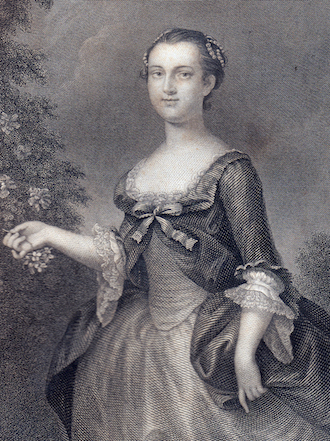 The soldiers loved to see her at camp, and she had to manage Mount Vernon for long periods while George was off fighting or engaging in the politics of forming a new government. Far from dowdy, Martha was a stylish woman who loved fine clothing, and set a standard for grace and sophistication as the first First Lady (although that title had not yet been coined). The Washingtons lived at the President's House in Philadelphia. They selected the site of the White House in the new city named for them, and oversaw its construction. Martha embodies a time when the world was lit only by fire. 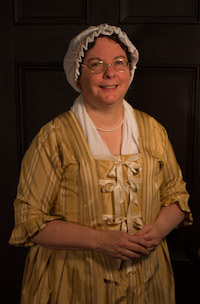 Conversing with her provides a fascinating glimpse into the lives of women and men during the pivotal time of our nations' founding, and especially the lives of women as they negotiated a world in which they faced many challenges.